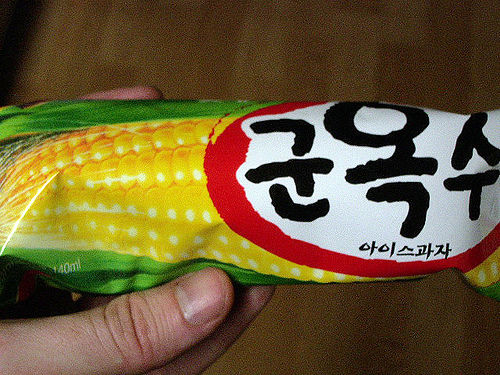 Continuing my fun with 50% off ice cream, the second interesting item I found was corn ice cream. Did they really mean corn? 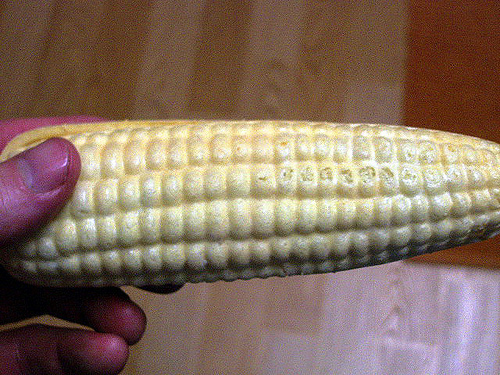 Corn corn? Well, the sweet potato ice cream wasn’t so bad. I’ll give this one a try. 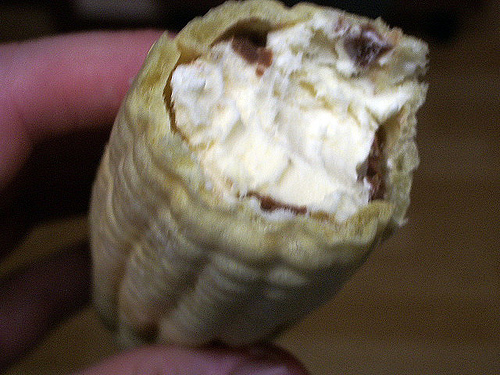 Just like the sweet potato ice cream, the corn ice cream came encased in an edible styrofoam mold. It bore a striking resemblance to its namesake. There’s no mistaking here. We’re gonna be eatin’ some corn. I wonder what’s inside. 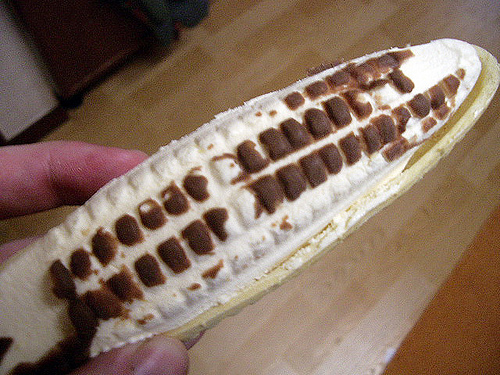 Looks like a vanilla-type ice cream with a thin spraying of chocolate coating, I assume to help glue it to the corn mold. That doesn’t look as appetizing. Put the mold back on. Mmm… creamy corny goodness. The corn flavor here is subtle. It’s mostly a generic vanilla ice cream with a hint of a–hmm–popcorn flavor. It’s like a popcorn jellybean. So now we have two surprisingly good ice creams. Maybe that’s an indicator that all these freaky concoctions are very good. I’d agree if I hadn’t had the misfortune to try a tomato popsicle last year. I tried to like it, especially since the person who gave it to me was enjoying hers so much. But after three tries, I put it down. Eh, Zen씨 Hope you enjoyed the snowy Sunday. Ive never beenan ice cream adventurer myself…I do the plain and simple vanilla,tried tested and tru. Have you ever made 계란찜 at home? I just got a dol-sot pot and wanna try cookin my fav. side dish at home. Dude, how can you eat ice cream in this freezing weather? I need to try this–now! Well you know that Maine people have lopster ice cream. Lobster ice cream sounds much scary. It’s a wafer type cookie a bit softened. It just feels like Styrofoam. Hi, I found your blog when googling “hot pepper tuna” (I picked up a can & I’m trying to figure out what to do with it). I was just wondering about the ice cream mold. You referred to it as edible styrofoam… is it really more like the wafer type cookie or a rice cracker (only umm.. chewier, not as crunchy/crackly)? I’ve never heard of edible styrofoam. Next time my hubby and I return to S.Korea, I’ll definitely try more of those treats! Just thinking about it (ice cream, chinese pancakes, ojingo – yeah weird combo, but hey!) makes my aegi move around like crazy inside my tummy! I always wondered if the wafer type cookies were really soft or if they were just soggy?? I love this ice cream, been searching every supermarket for it, but I cannot find it anywhere. Where can I find it? ?